I feel like it's been forever since my last spot the steal post, and I think it's time to start bringing them back because I must say I've been seeing some great finds across the internets lately. 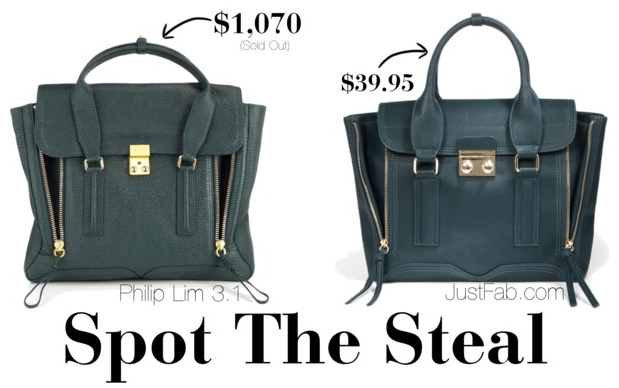 Most recently at JustFab, and not just in the shoe department but in the handbags. With varying designer inspired styles, you can grab your first one at $20! My favorite steals were the Celine Boston & Philip Lim 3.1 Pashli inspired bags, but I'm sure you can spot some other designer styles. Last year's must have spotted on Leighton Meester, has quickly become a classic, and how perfect is B&W for this season? Such a fun post idea, these are really good copies, it would be difficult to decipher the difference. Awesome. Thanks for sharing your tips ! I'd never visited Justfab.com but I definitely will now! These bags are so cute. Love the black&white bag! Great 'spot the steal'. It's remarkable how close they are, and while I appreciate the ability to buy an adorable bag for an affordable price, I'd rather have the real thing!! Great blog post idea though! they're both great bag designs, no wonder they're copied! I think I have to go to JustFab and get that Midtown bag. It's beautiful! Seriously you need to do more posts like this. Love it! I ordered the Midtoen bag last week as my start in the Justfab VIP club and it arrived today!! The bag is very nice and the quality seems great it doesn't feel cheap and it looks amazing! !